Share your demo reel and get famous! Since eYeka started out 6 years ago, you have been the focus of our attention. We love communicating with you and helping you grow but above all, we love looking at your work! We were completely captivated by your creativity. To thank our beloved community, we believe we can help you become even more famous. Today, we are introducing a new kind of contest: a monthly “get famous with your demo” contest. This month we are starting with video makers. We call every video artist to upload a demo reel and compete for two cash prizes of 250 EUR. 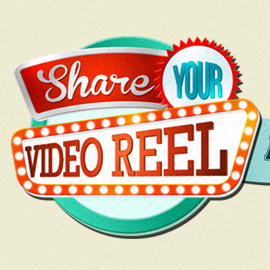 Share your reel and show us how talented you are! Besides your technical skills, you are also great story tellers and talented video artists… shine on! Format: videos, maximum length 90 seconds. Contest will run until October 20, 2013! We are really looking forward to receiving your entries! Share your Portfolio and get famous!